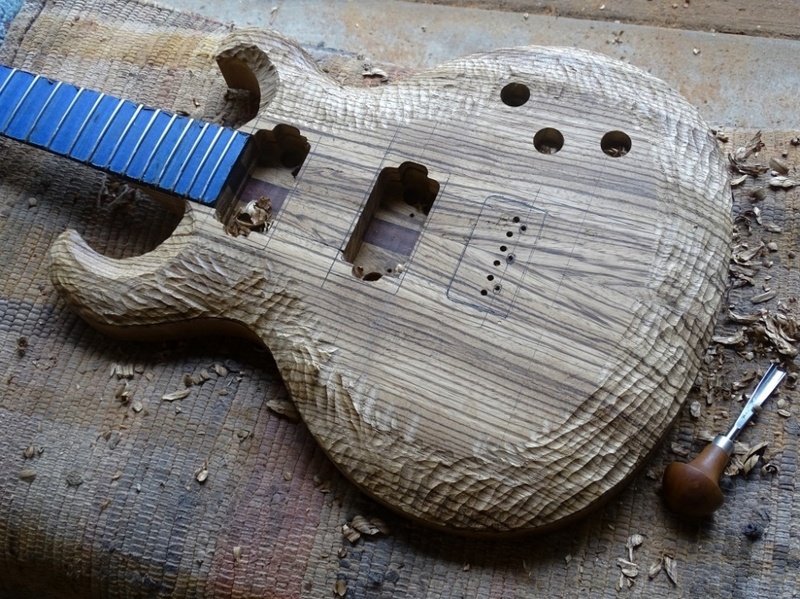 I must say @ScottR I just love your carving, I have tried it in the past but found it to be a steep learning curve, have you a natural talent or is it just years of practice.or perhaps some other secret. It may be a bit of all that. I've been carving enough to buy actual carving tools (more sophisticated than a pocket knife) since the early 90s. 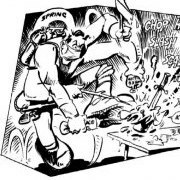 But I've been an artist all my life and that surely helps me see spacial relationships and maybe gives me the ability to visualize what the end product is supposed to look like, whilst I'm removing all the wood that is not actually part of that end product. 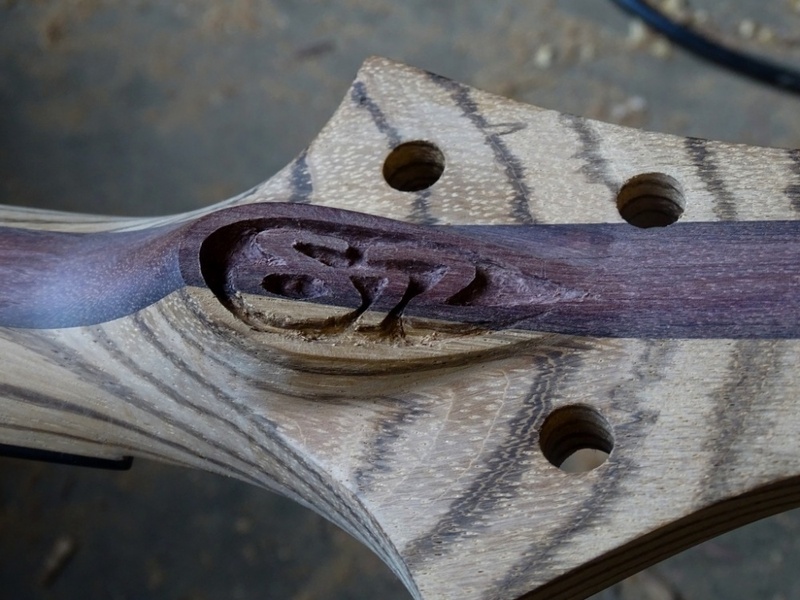 It occurs to me that while I did finish carving my logo in the volute, I did not take a picture of it. 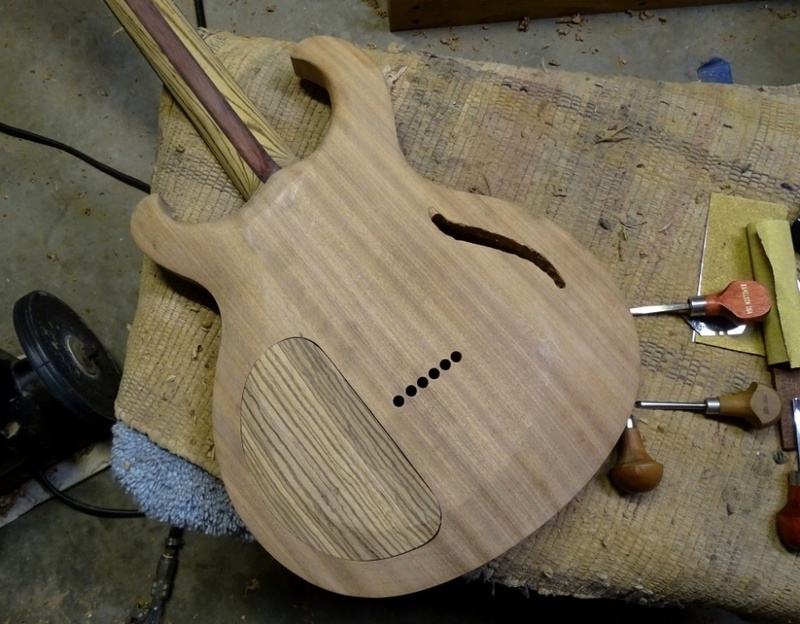 Note to self: shoot the damn volute next weekend! I did route a neck pocket. I used this set up to set the depth of the pocket. 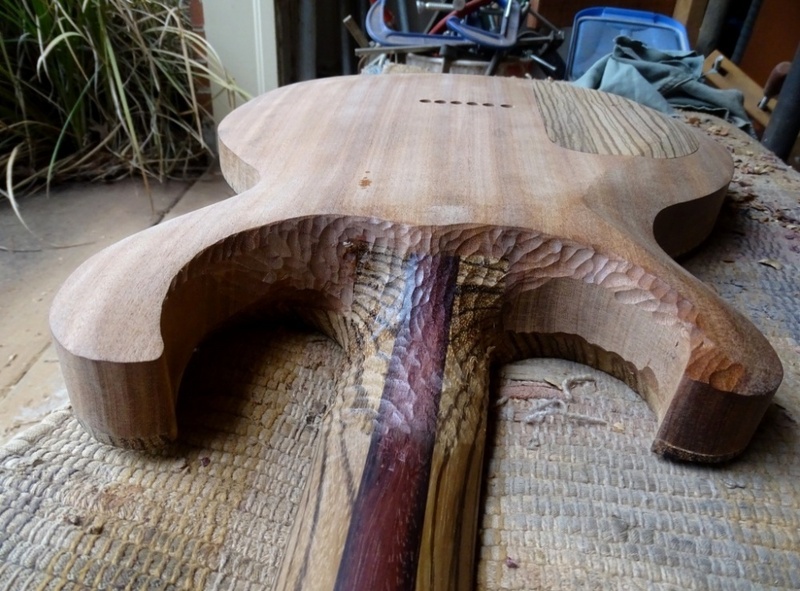 The thickness of the top plus the height of the bridge to the lowest saddle setting is one inch. 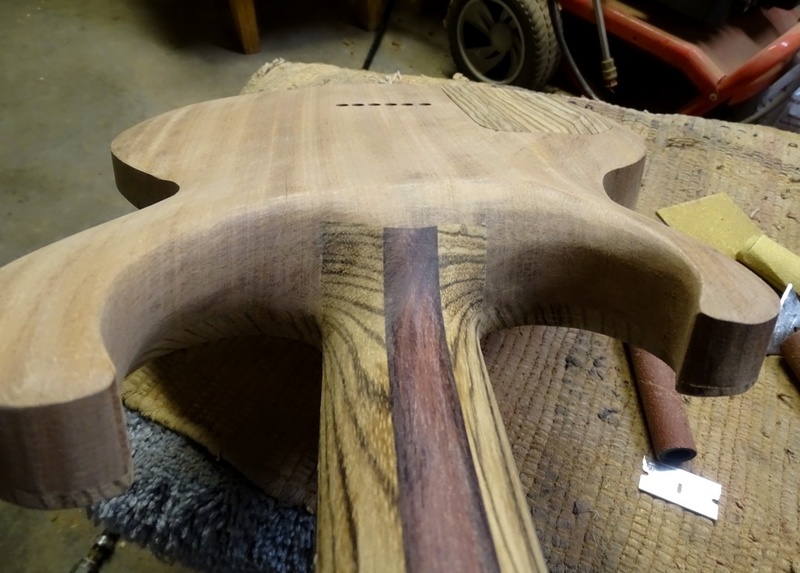 I didn't expect the tenon to be quite this flush with the body surface with the neck set to the correct depth...but hey--that makes less work cleaning it up. 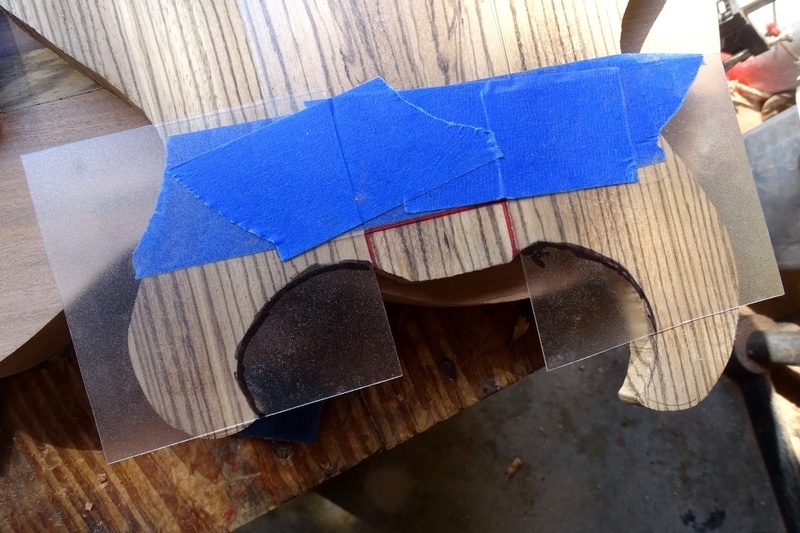 I make a simple pattern out of three pieces of clear polycarb, and transfer it to the top. I cut the neck pocket into the top right down the center of those red lines and then used a template and routed the edges to clean them up. 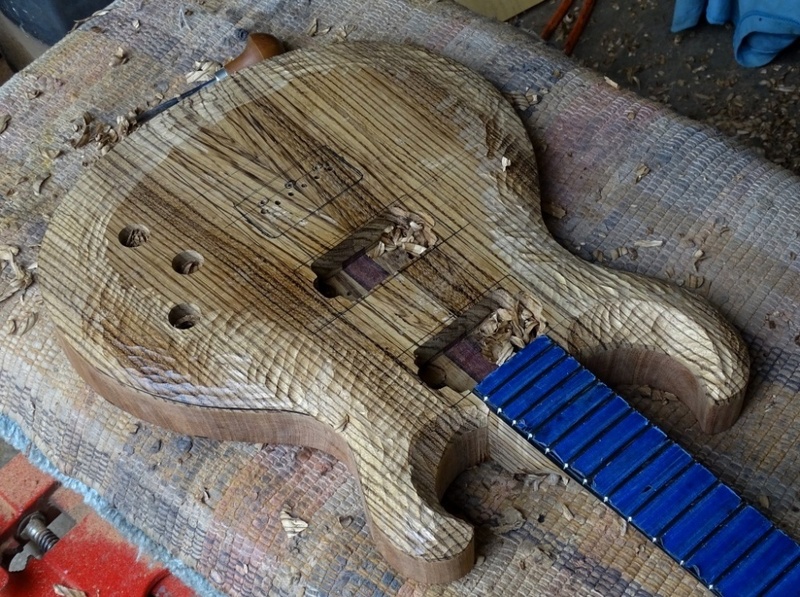 I went past the end a bit because that is coming out anyway, for the pickup cavity. 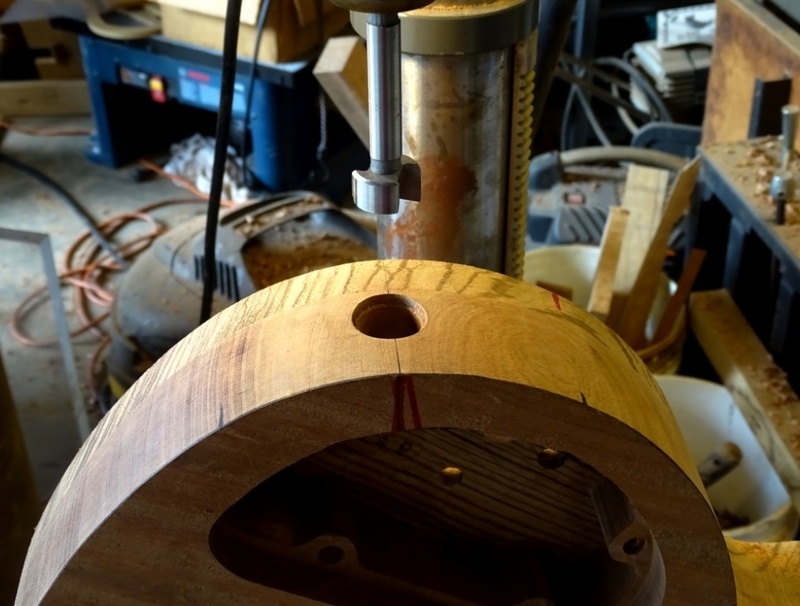 In a different thread I had mentioned that I wanted to find a spiral top bearing pattern following bit. 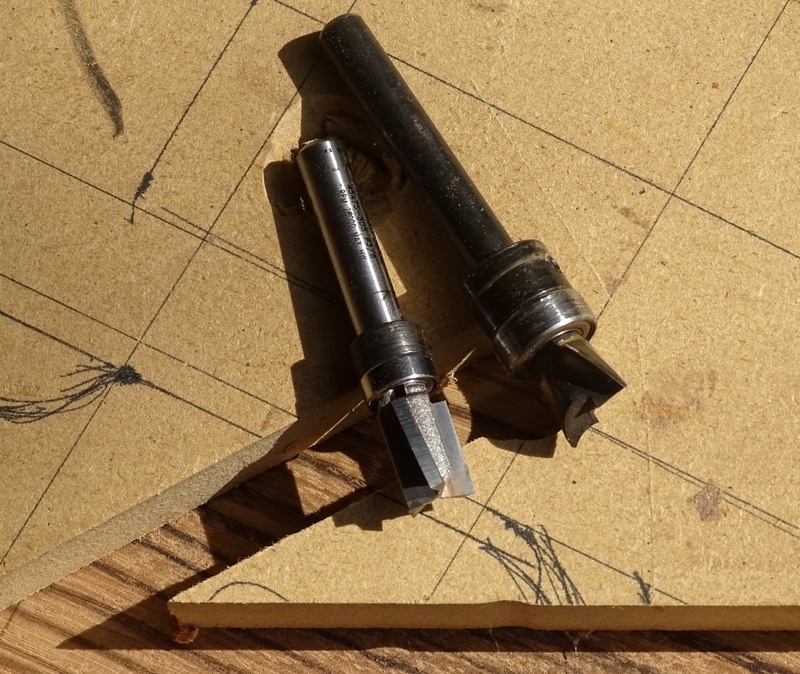 The half inch diameter bit on the right is what I wanted to replace, and the 3/8" diameter three flute angled bit on the left is the closest I came. I will say that one cuts like butter so far. Its half inch diameter big brother seems to want to chatter more. 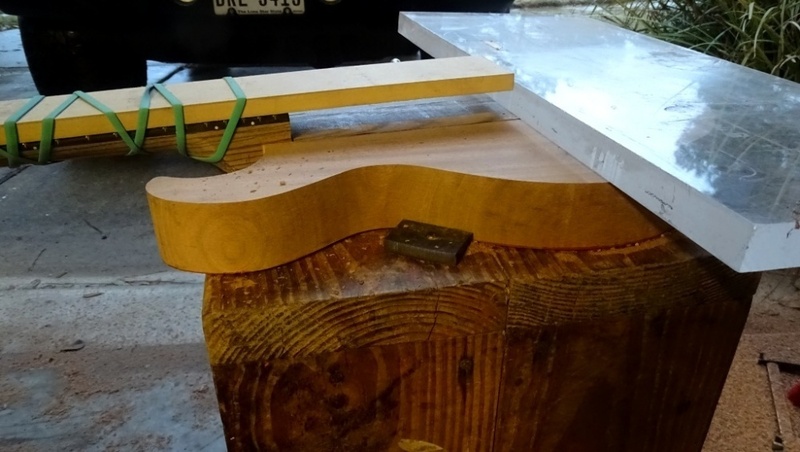 I like to screw the top on in the pickup route waste area for glue up. 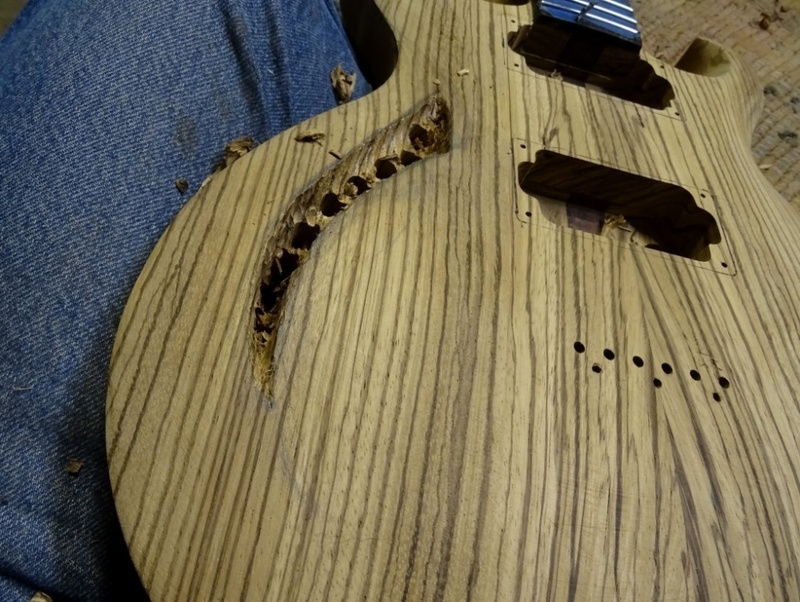 Zebrawood chips badly, as I found out once again countersinking for the screws. This is likely to disappear during the normal course of things, but it makes me feel better to glue it back in for now. And the top is glued and clamped. wow- I cant believe the tear out you got there Scott- grain run out right in that area it appears(?) you are going to want to go super shallow super slow when you route those PUs. 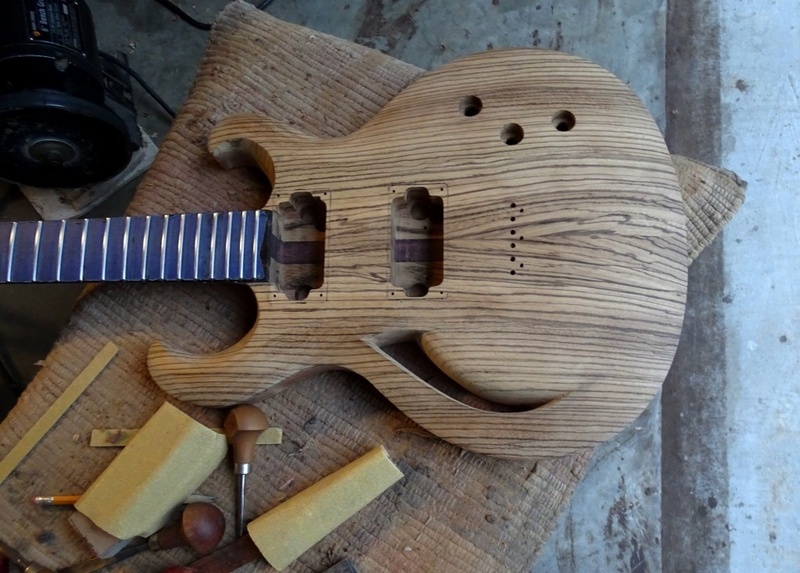 that stuff looks to be as bad a purple heart and wenge-two of my least fav woods to work with. Zebrawood and probably most other species that have that interlocked grain that gives us that nice ribbon stripe figure is funny stuff. 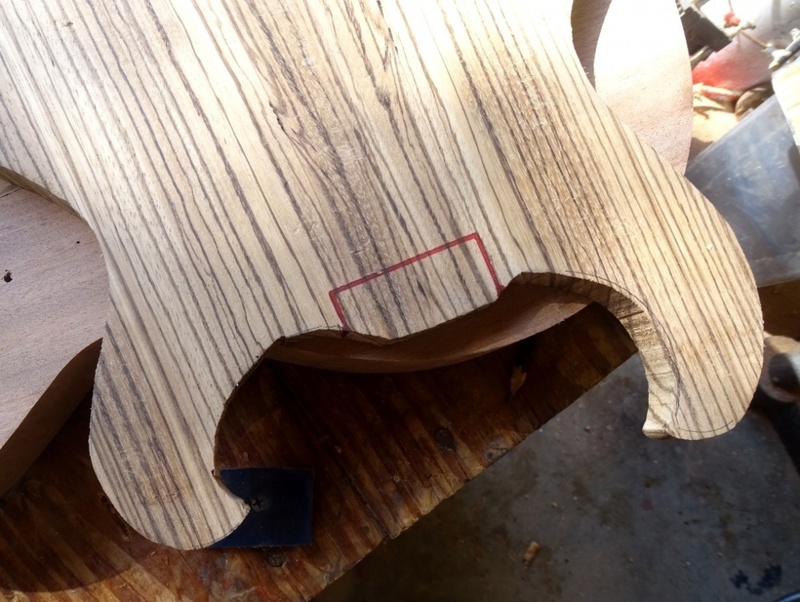 In quartersawn wood you have grain run out an inch away from no grain run out. Rinse and repeat across the face of the board. This was mostly my fault as I used a larger drill bit instead of a countersink bit, since I couldn't find it quickly enough. I wasn't worried since it is a waste area....but I wasn't expecting to lose that big of a chip either. It looks like you'e done a great job of saving the chip! 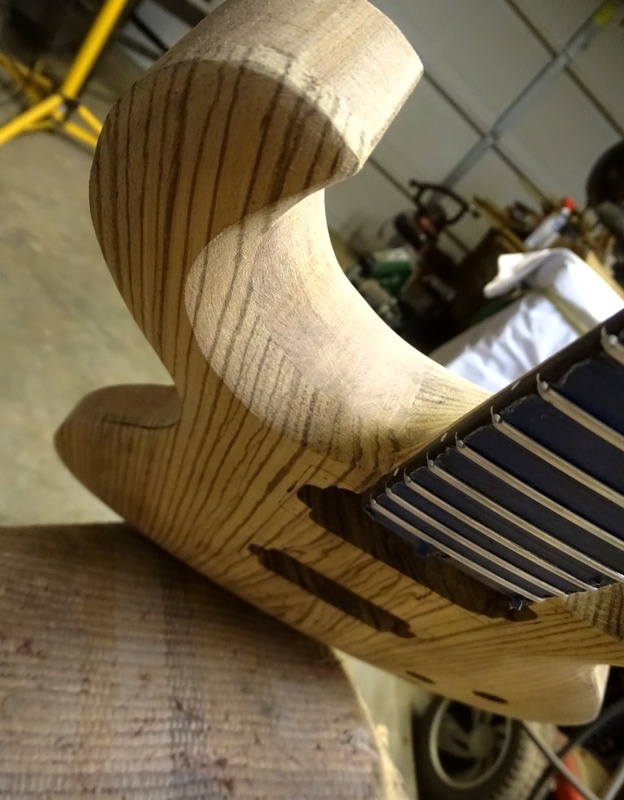 I can't wait to see this oiled and polished up to your usual standard. I'm looking forward to that myself. 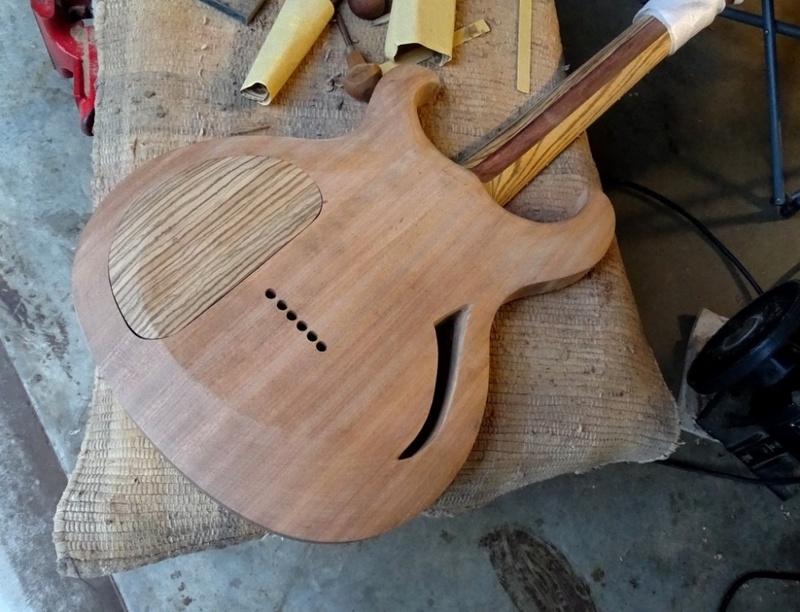 I'm planning to use a few tricks I learned in my electric mandolin build. 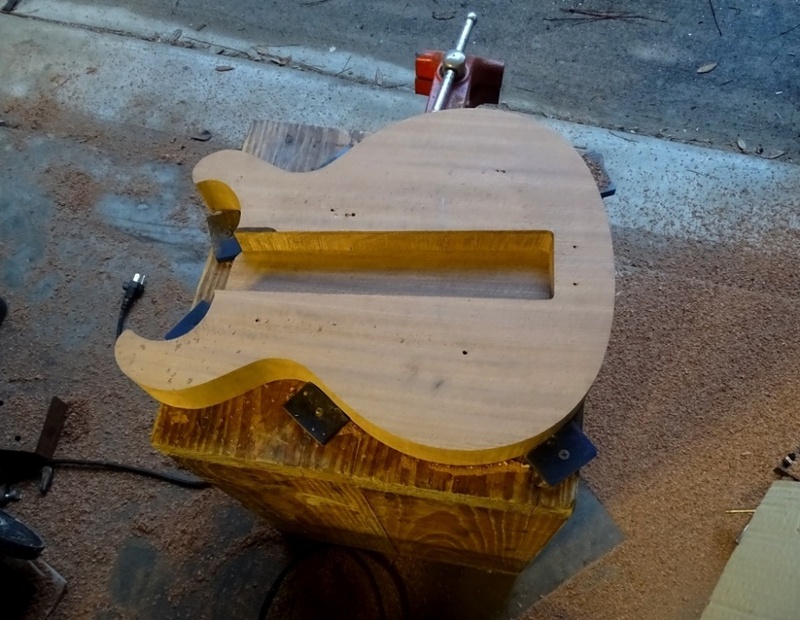 Out of the clamps and pickup cavities routed. Next I located the bridge and used it as a guide for the string through holes. Note that the bit is chucked up pretty high to minimize bit wander. 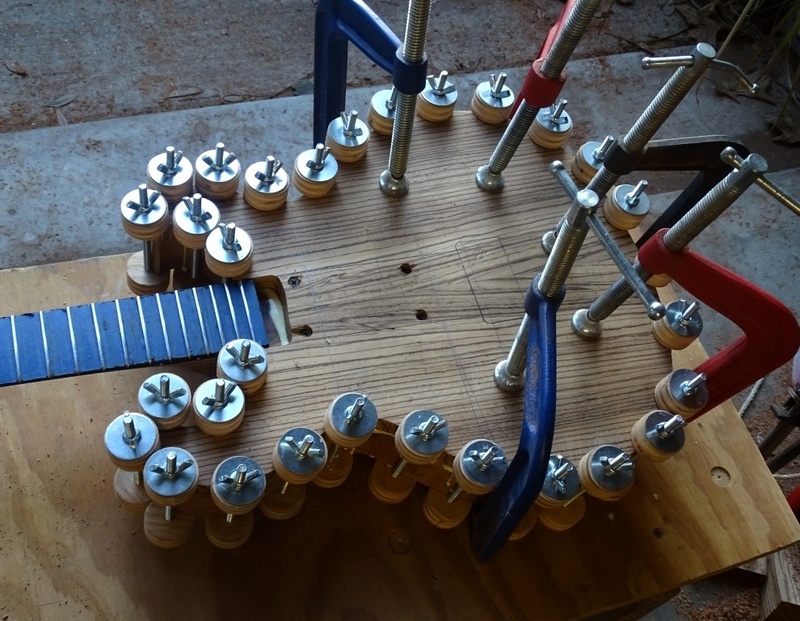 I have a pin system I use for drilling the string holes from the back side. 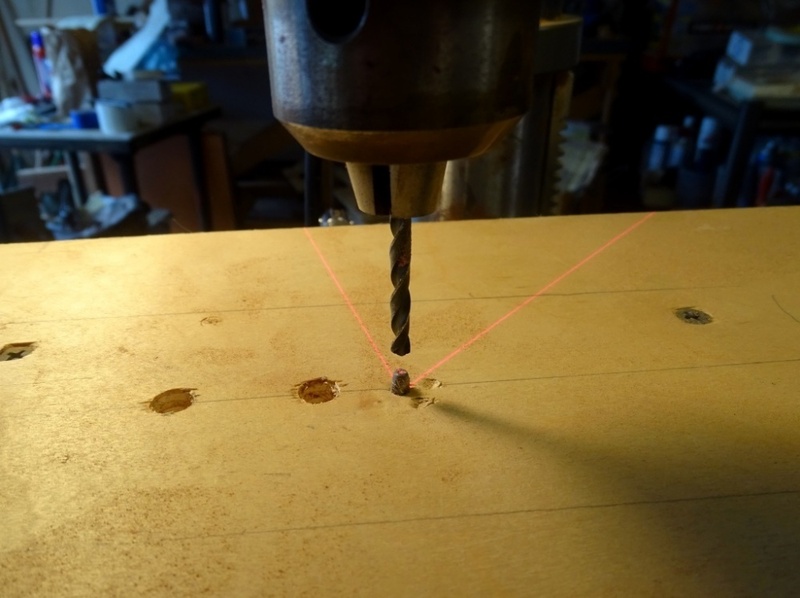 The pin is the same diameter as the bit and is lined up directly beneath the bit used to drill the holes from the top side. 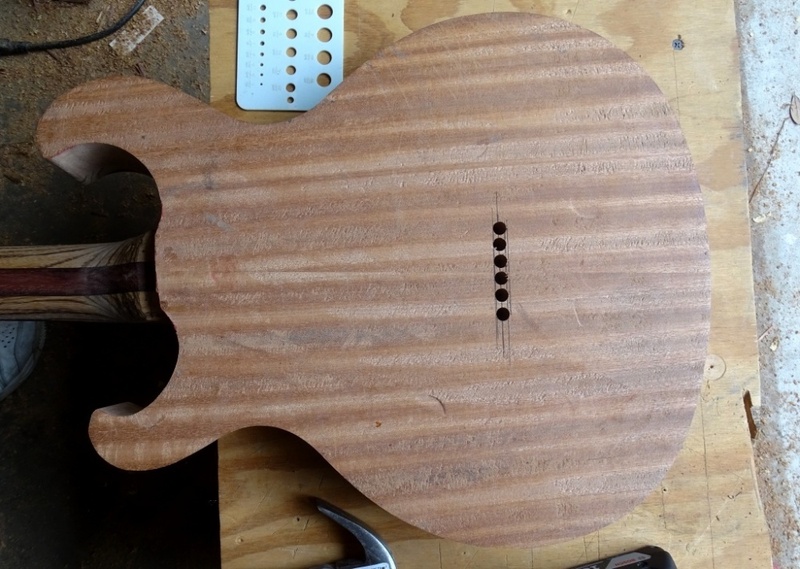 One then flips the guitar over and sets each string hole onto the pin and drills ferrule sized holes from the back. 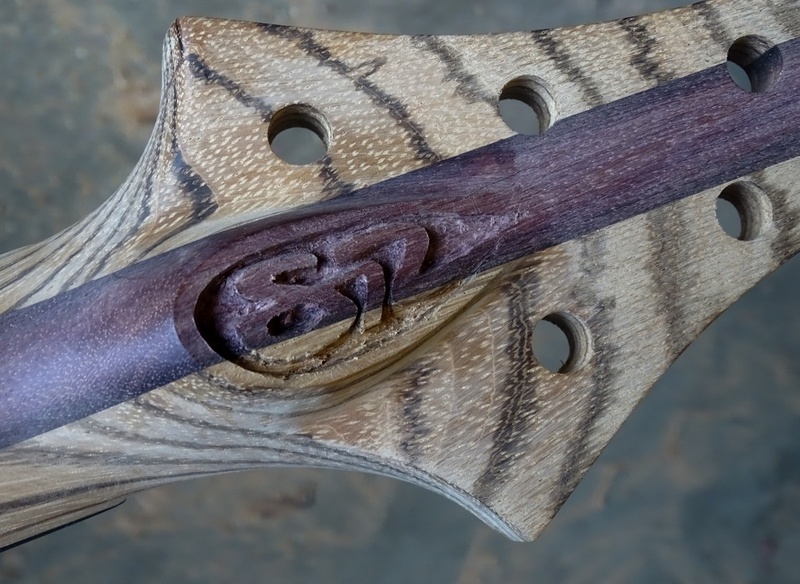 Oh yeah, once it is turned over, I remember to shoot the logo carved into the volute. 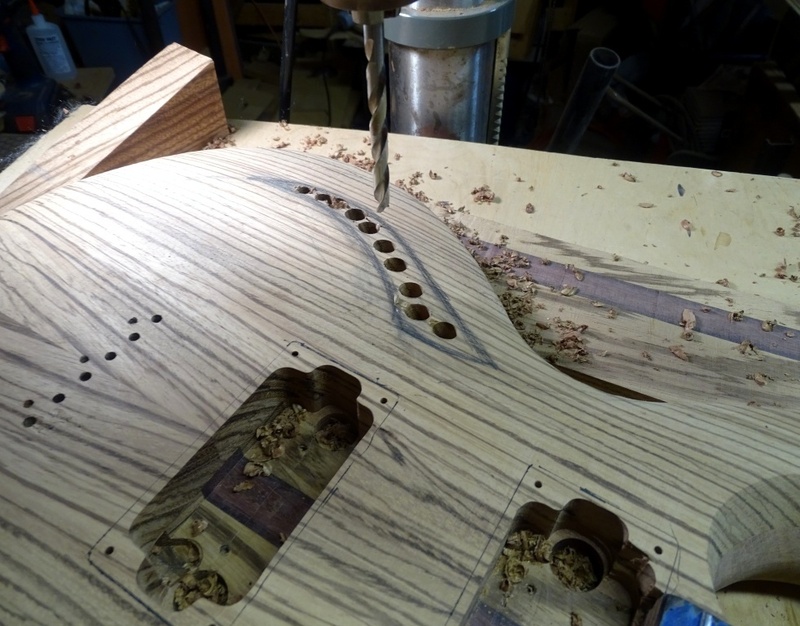 Next was locating the control cavity and routing it along with the knob and switch holes. 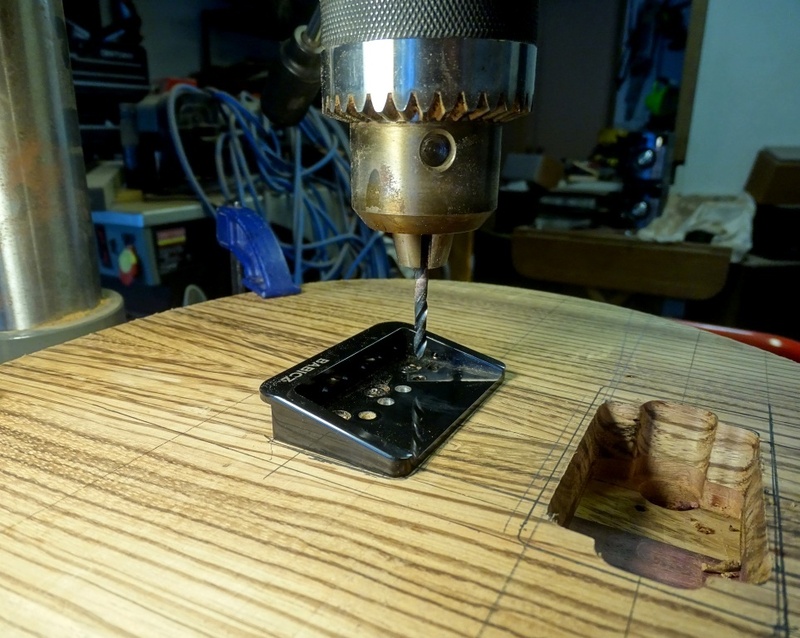 Then I clamped the guitar on edge and drilled the jack access and cover recess. 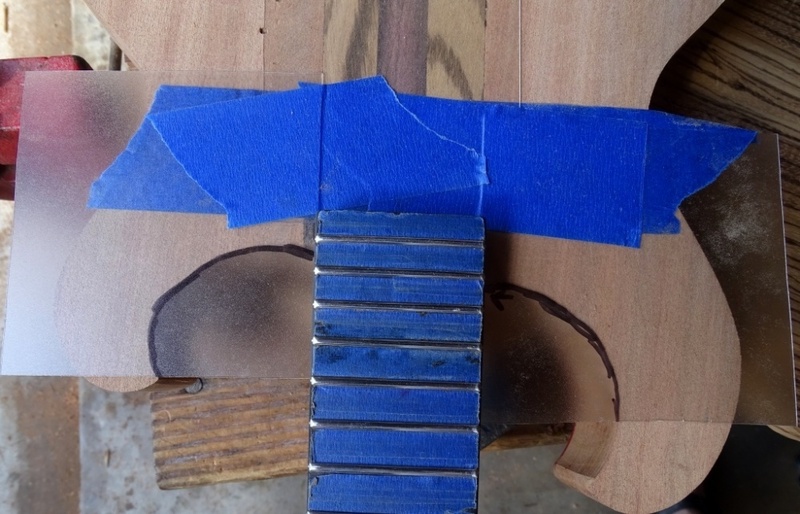 I set up for screws and magnets in the cover, but for some reason the attraction didn't feel as strong as it did when I used this system in my last build, the electric mandolin, so I ended up swapping the screws out for magnets in the cavity as well. 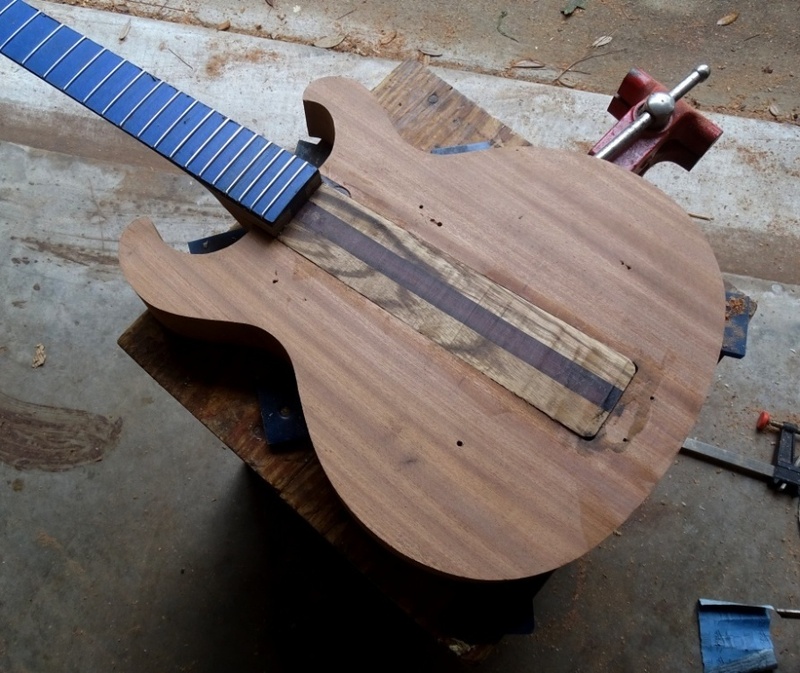 It is starting to look rather guitarish. 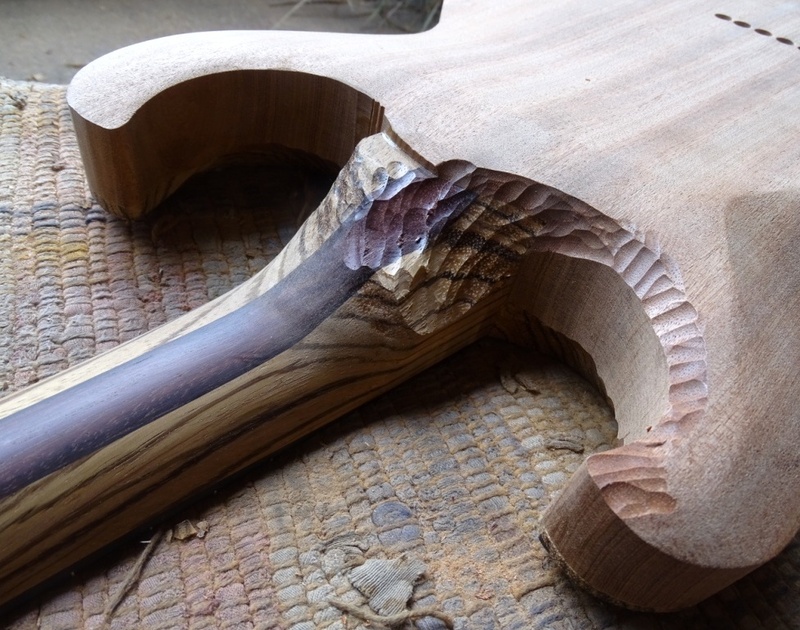 Your guitar necks are probably some of the nicest I have ever seen, Always very clean work. 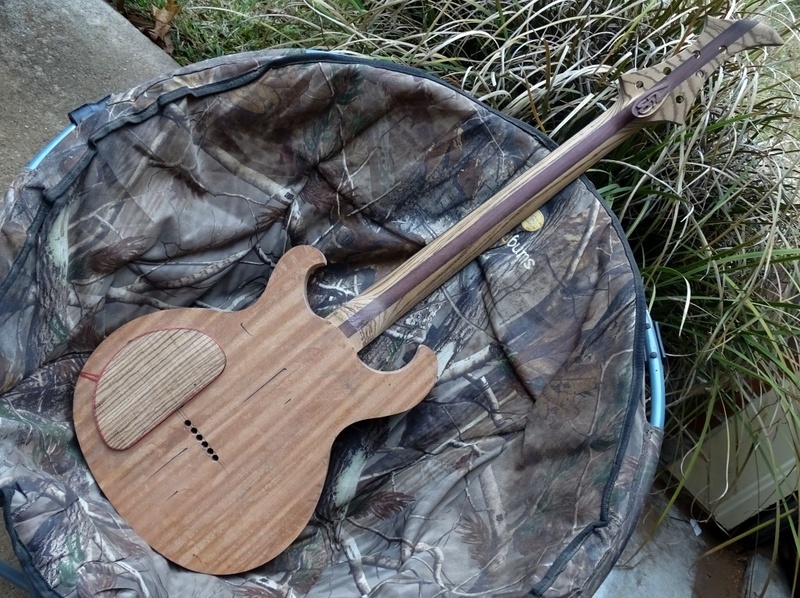 Looking forward to see that Zebrawood under some clear, or are you going with just oil? I'm going with Tru-Oil. 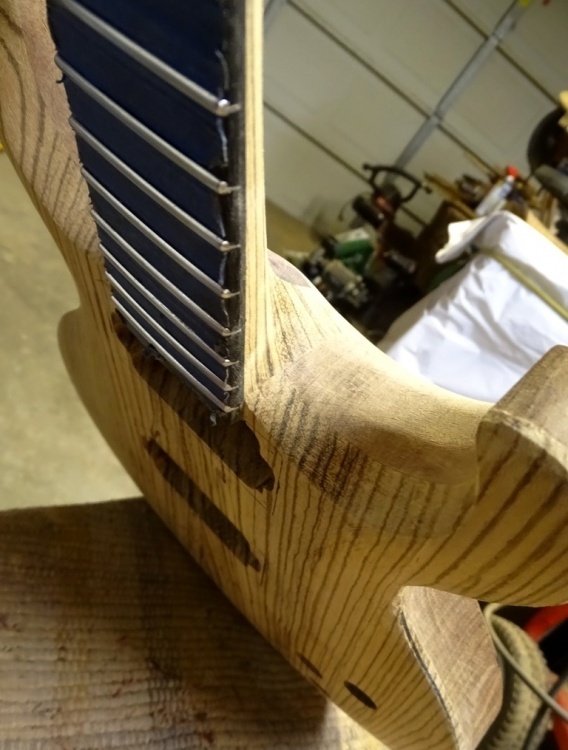 I'll darken the pores and polish the wood, then build up some film with a tint burst buried in it. I've got some F4 pumice and will use that and slurry to pore fill in the manner @Prostheta has been telling me about for several years. Hopefully I can get that to work... and then I'll polish the cured oil to within an inch of its life.....maybe even within a half inch! I've explained it in more detail in past builds. It sometimes feels like I'm repeating myself when posting techniques I've used on a number of builds. Then I find myself paraphrasing or going into less detail....I need to remember that some folks will be reading these posts for the first time. The pin system allows you to translate the spacing from the front holes to the rear and works quite well if done correctly. 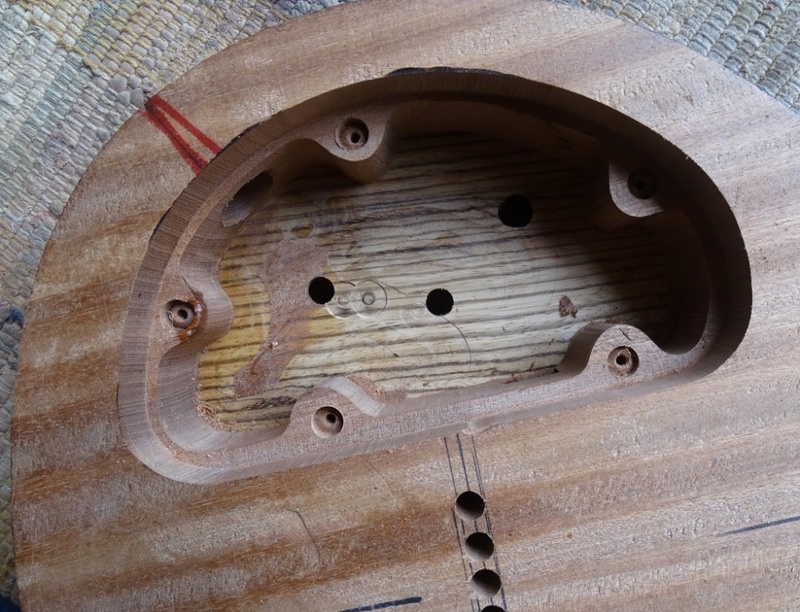 My holes appear to line up well, but the spacing is not quite uniform. That likely means clamping the workpiece in place in each location pulled it just a hair out of square. 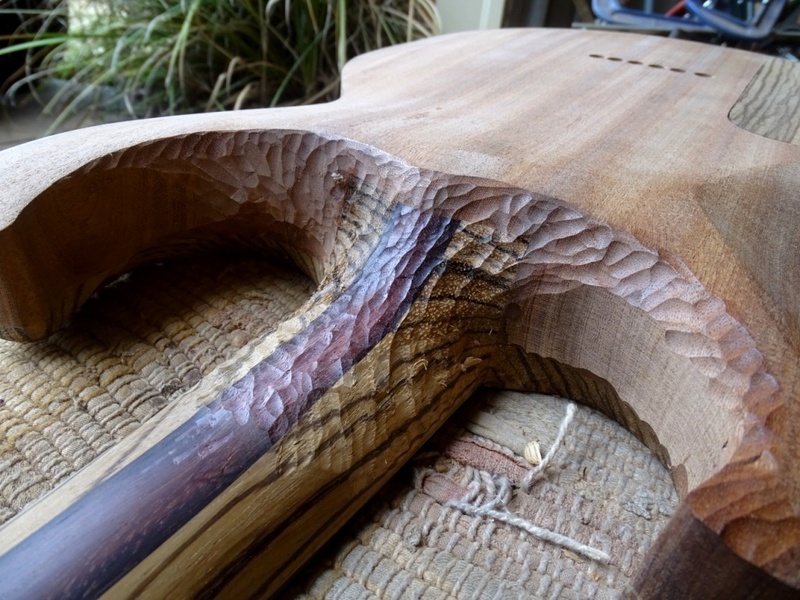 Funny that you mentioned Zebrano and pore filling. This is a test build that morphed into a crisis build....one that I don't have to meet the pressures of documenting or filming! 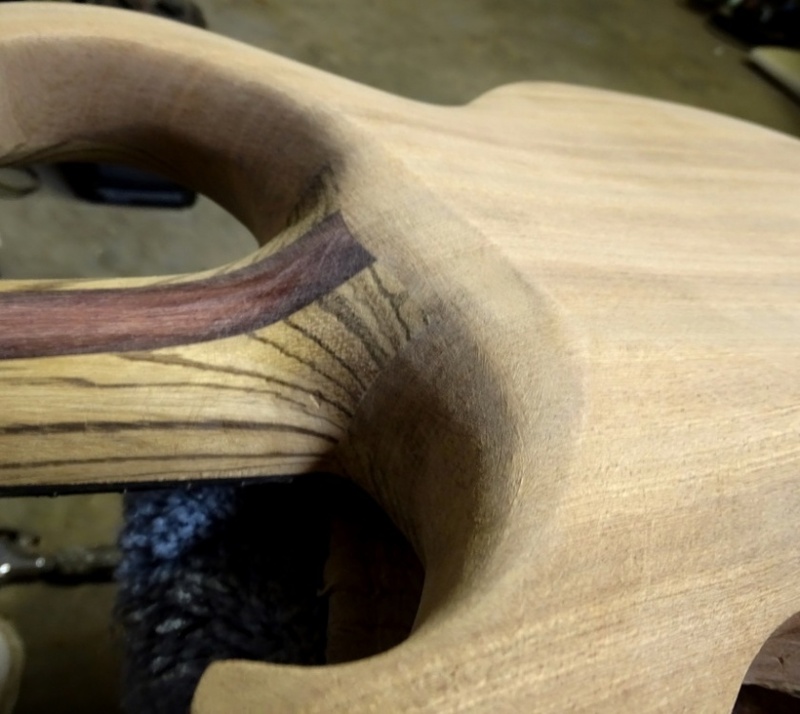 This is a black grain fill with tobacco-ish stain and clear. Not sure whether to paint the back black or not. 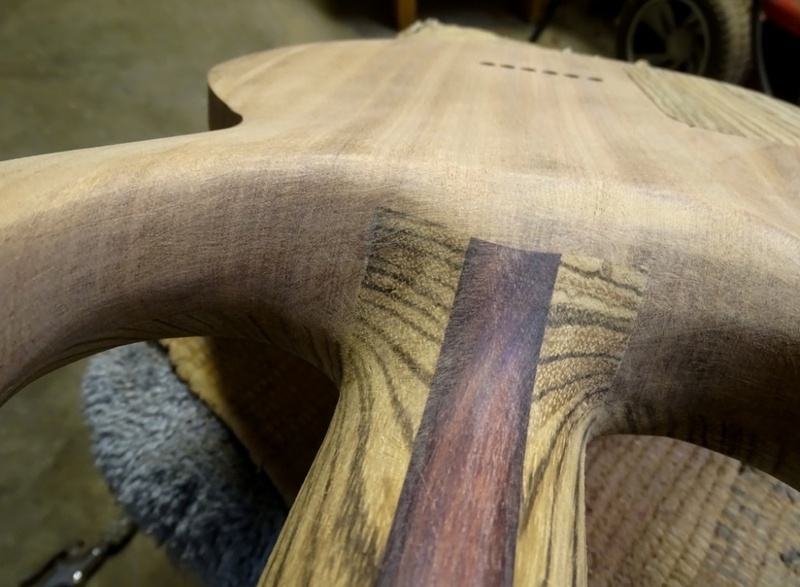 The problem I have found with Zebrano is that the high contrast between the early and late wood makes a grain fill liable to contrast against one or the other....or both. Personally, I think it looks fantastic this way. 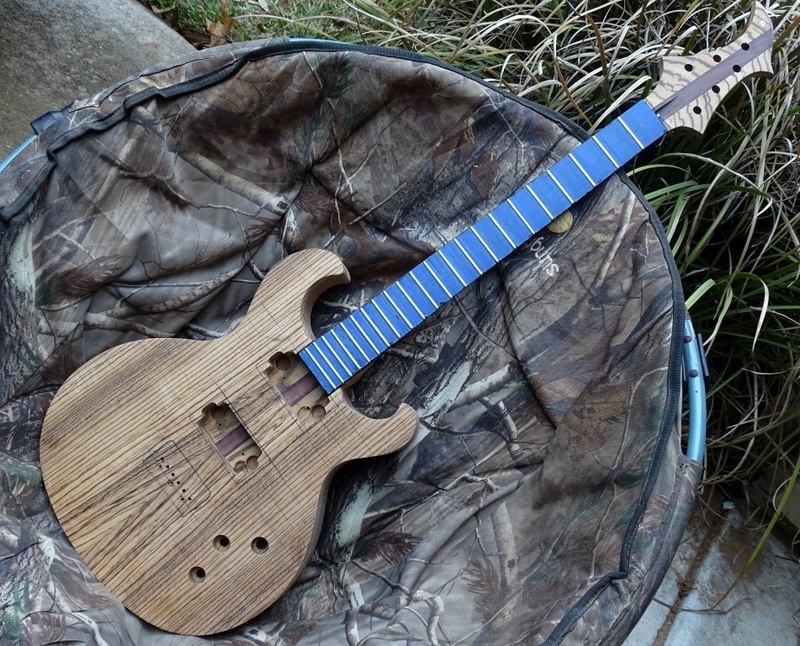 Unfilled with a black/tobacco dye faux burst. Tempting also. 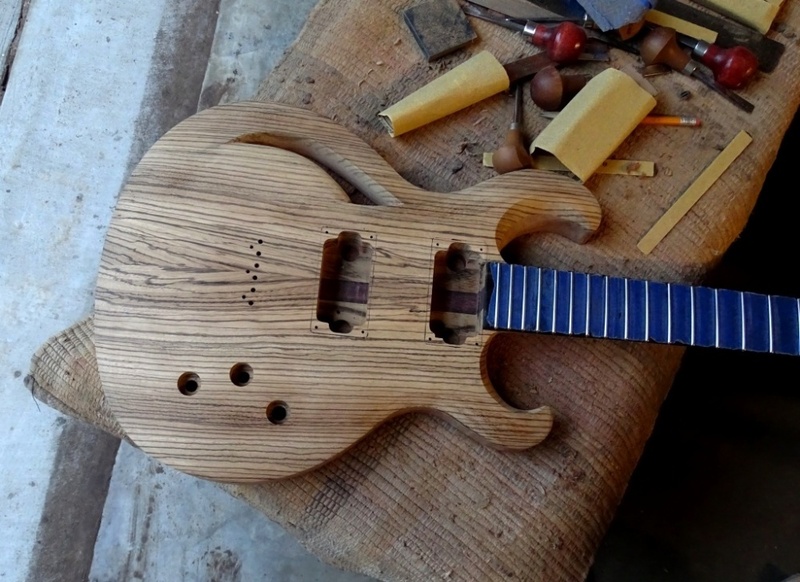 Reminds me of 70s Gibsons for some reason. 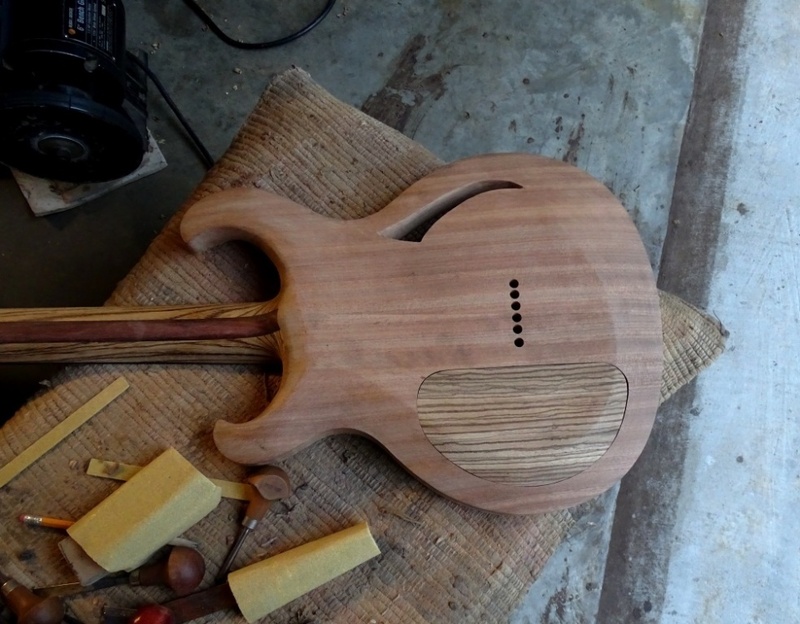 Strictly-speaking, pumice was the product of choice for abrading a fresh surface and filling the grain as part of a larger French polishing schedule. The (very thinned, half to a pound cut?) 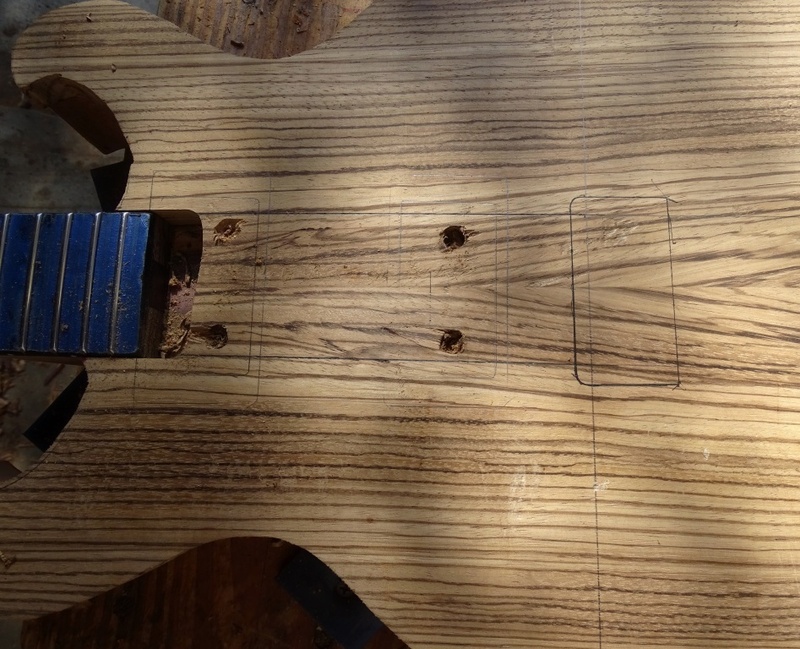 shellac binds the pumice and slurry in the pores. Using pumice as an abrasive and filler with Tru-Oil should be approached the same way. Very little oil should be on the surface, just enough to keep the pores packing than being filled dry and evacuated. Interested to see what you opinions are of doing it in this manner and the end result, Scott! 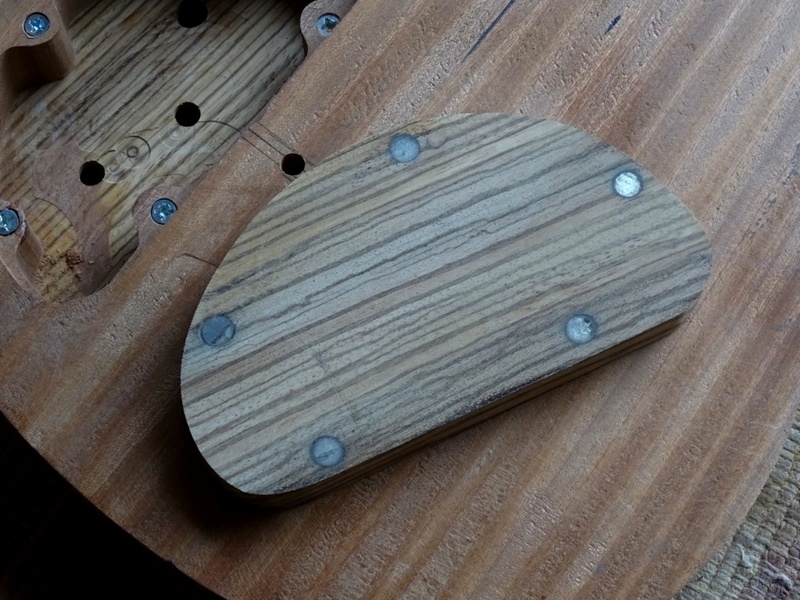 The electric mandolin had dark grainfill on the zebrawood back and clear fill on the headstock cap. Both looked great. Like you say the dark fill does cause the characteristic stripes to be less prominent by reducing the contrast. But it tends to increase the contrast of the chatoyant "flip" of the interlocked ribbon figure. Like you, I think it looks fantastic as well. I'm interested in how the pumice method works as well. There will be a certain amount of practicing on scrap in play while the build progresses to that point. I even picked up some Tripoli and paraffin oil to see how that style of polishing works on the cured Tru-Oil film. 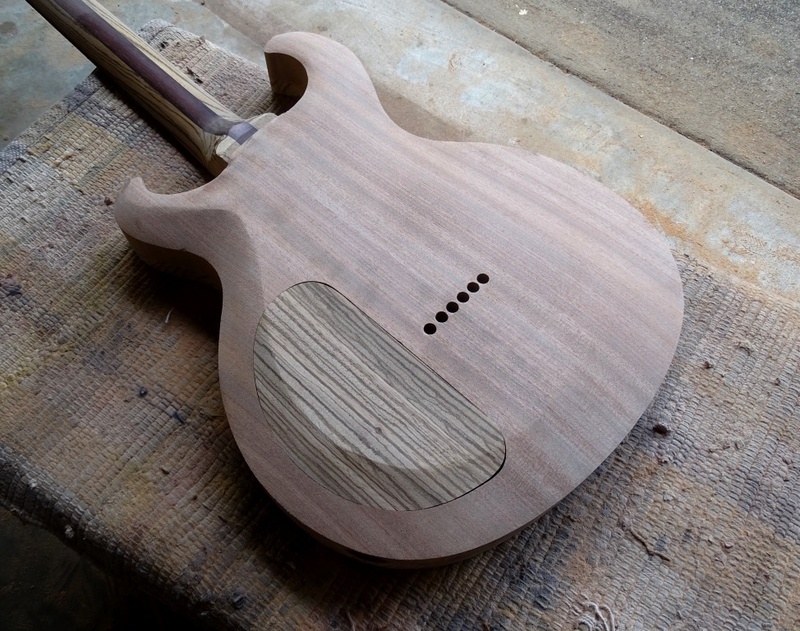 I rough shaped the back. And then started carving the top. 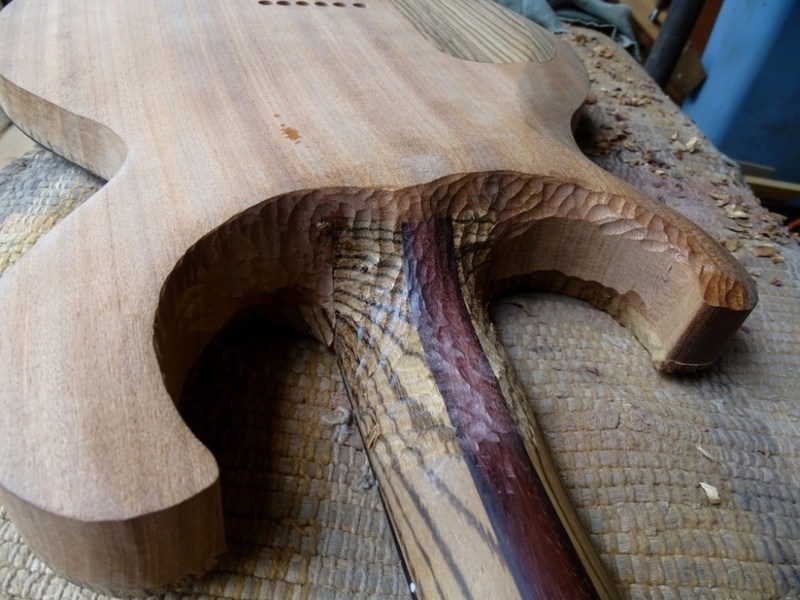 Then carved the neck join. 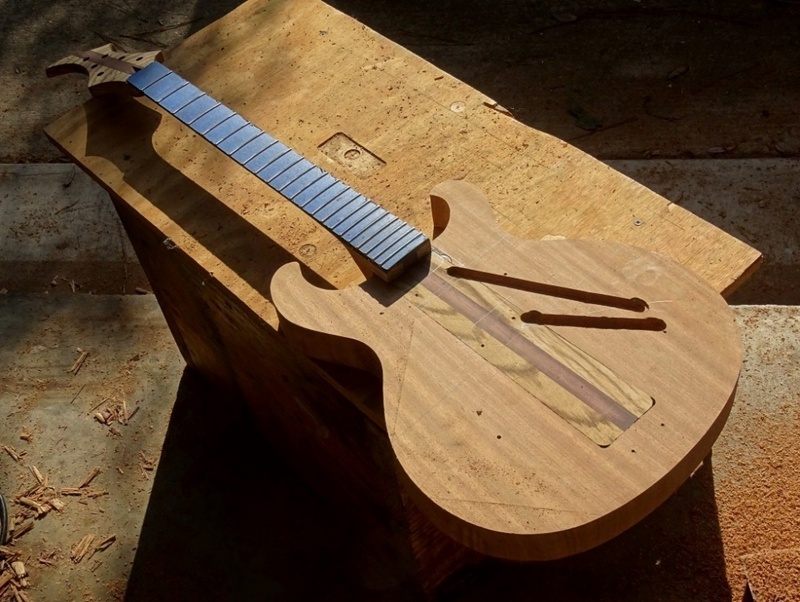 Then smoothed the top and neck join. Time to begin the F-hole. 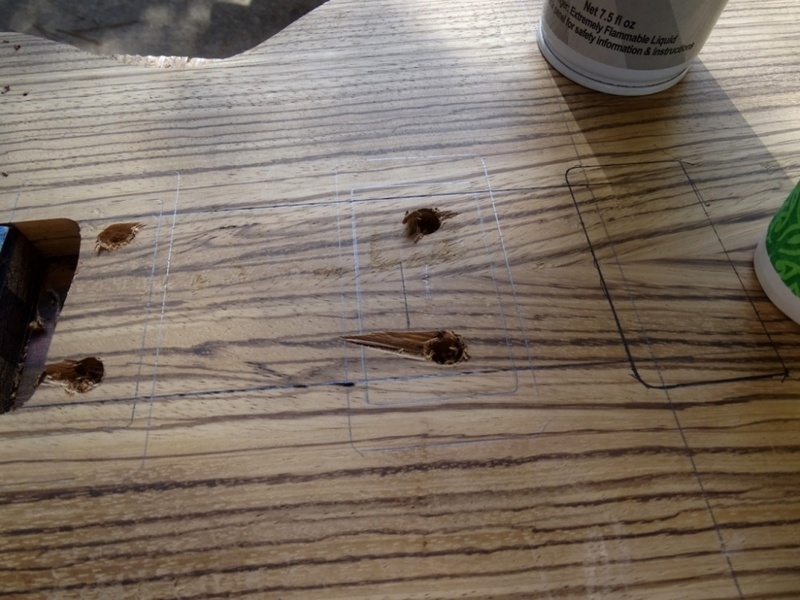 Drilling through not only removes wood but also shows me the location on the back. 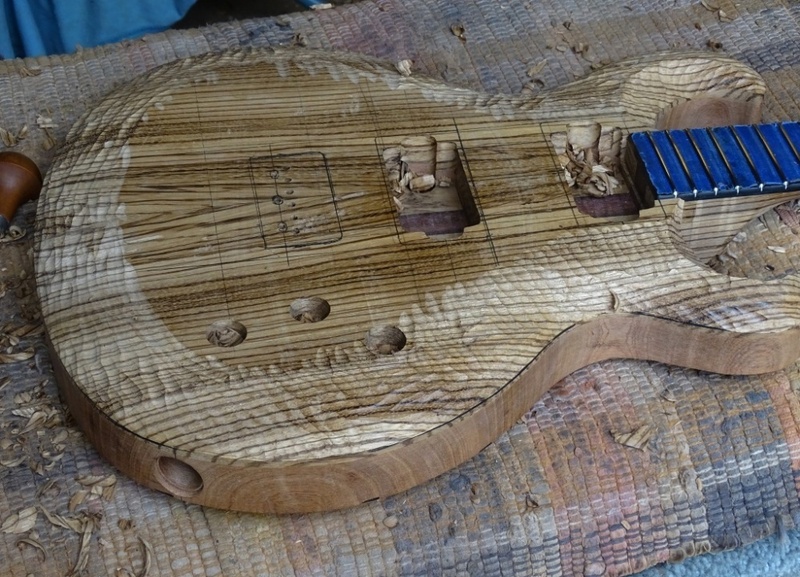 After drilling it's time to start carving.